If you would like your child to join our group please be aware that we may have a waiting list. Priority on the list will always go to those children who are currently waiting to move up from one of our 2 Cub Packs. To find out more and, if desired, put your child's name down on our list please click here to email Bob (Scout Leader). Please note, the above is for the Scout section (ages 10 to 14), for other age groups contact the relevant Leader as shown below. 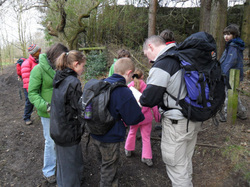 For any general enquiries about the Group as a whole contact our Group Scout Leader (GSL). Beavers (age 5.75 to 8) We have two colonies, one at Parish School on Tuesdays (click here to contact), the other at Boarshaw School on Thursdays (click here to contact). Explorers (age 14 to 18) we have a unit attached to our Group, they need at the Old Grammar School on Wednesdays (click here to contact). ​For general enquiries about our Group as a whole click here to contact our GSL. "...the physical, intellectual, social and spiritual well-being of the individual, helping them achieve their full potential. In Scouting, we believe that young people develop most when they are 'learning by doing,' when they are given responsibility, work in teams, take acceptable risks and think for themselves." We do this by getting outdoors whenever we can, either on camps and hikes or, during the Summer months, by holding our weekly meetings at Ashworth Valley campsite. Whatever the time of year, wherever we are, we play games, work at team building activities, work on craft projects, cook, carve... in fact almost anything that gives our Scouts the opportunity to push themselves further, learn new things and gain confidence in their own abilities. If you would like to learn more about The Scout Association's aims and objectives please visit their website by clicking here. 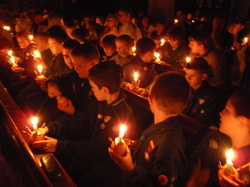 · We are at scouts to have fun – go out there, see what we can achieve and more! · Most importantly – Be enthusiastic, Enjoy Ourselves and Have Fun! · We also believe in the truth – We would always prefer a Scout to accept responsibility for any inappropriate behaviour and to accept their sanctions accordingly.